KEY FEATURES: A weak-stemmed shrub, to 1m. LEAVES opposite, ovate, hairy, 8x4cm; petiole 2cm. FLOWERS terminal, drooping spike to 15cm; overlapping heart-shaped, downy bracts, 3cm, yellow-green to brown to red; corolla 2-lipped, white, red spots on lower lip. The cultivar "Yellow Queen" has pale green or green-yellow bracts. 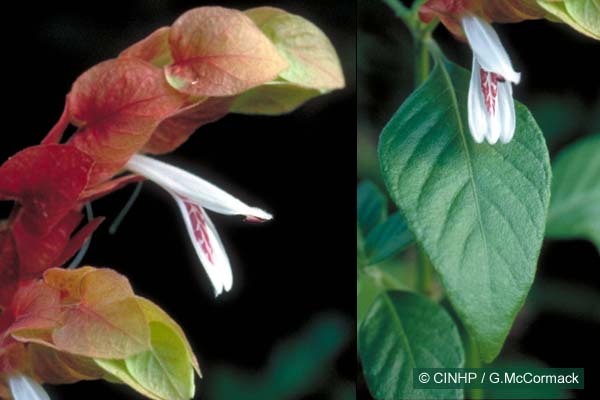 Justicia brandegeeana Wassh. & L.B. Sm.